How to Easily Master Format SAMSUNG GALAXY ON7 (PRO) with Safety Hard Reset? Tips and tricks to fix problems at SAMSUNG GALAXY ON7 (PRO). This phone use 5.5 inches LCD screen but without Super AMOLED screen type. The screen resolutions is 720p HD resolutions. We can run multitasking applications using 2 GB RAM ata SAMSUNG GALAXY ON7 (PRO). 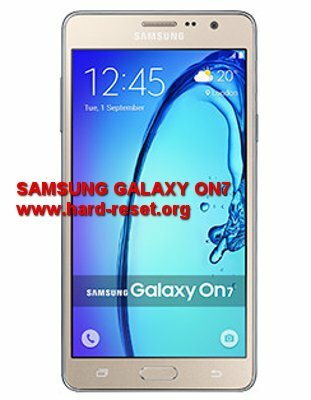 Find several solutions about how to solve trouble at SAMSUNG GALAXY ON7 (PRO) at www.hard-reset.org. When the first time we activate this phone, the Android Marshmallow operating system has already installed. There are also SAMSUNG GALAXY ON7 PRO which have type G600FY. We can use dual simcard provider which can standby together, but we only can received one phone call at a time, the other call should wait. What is Advantage of SAMSUNG GALAXY ON7 (PRO) Specifications? How to backup data or Contact at SAMSUNG GALAXY ON7 (PRO) ? After install several apps, we have to aware about backup data when we use SAMSUNG GALAXY ON7 (PRO), especially to keep our data safe while this phone hang or trouble or lost. We can use microSD external card to copy or move important files using File Manager applications. If our SAMSUNG GALAXY ON7 (PRO) has already signed in with Google account, by default our contact will be synchronize in the background to Google server. Please make sure we check all contact at Google contact server using Internet browse to make sure backup is done. Backup at external microSD is very simple, we just have to prepare microSD simcard and put it at SAMSUNG GALAXY ON7 (PRO) slot. The capacity can be use start from 2 GB or 4 GB or above with maximum 256 GB. Please use available file manager to move photos or videos or other important files to external microSD simcard. The SAMSUNG GALAXY ON7 (PRO) will doing the process of restoring to factory default. Is That Any Secret Code for Doing Format SAMSUNG GALAXY ON7 (PRO) ? We can try to use secret code for doing hard reset SAMSUNG GALAXY ON7 (PRO) is *2767*3855#. But please remember to always be careful typing that code, because the SAMSUNG GALAXY ON7 (PRO) will do hard reset and remove all data also installed applications. How to Format or Erase Phone Memory at SAMSUNG GALAXY ON7 (PRO) ? There are two phone memory type at SAMSUNG GALAXY ON7 (PRO), one is internal memory and the other one is external memory. If we want to format internal memory phone then we have to do hard reset or reformat the operating system of SAMSUNG GALAXY ON7 (PRO) as well. Please use menu setting to do hard reset or reformat using #option 1 above, but make sure to give checkbox mark at Erase Internal SD card / Internal storage. Then it will reformat the factory default operating system and remove or erase any data inside internal memory. How to Make Battery of SAMSUNG GALAXY ON7 (PRO) Stronger, Life Longer and Not Fast to Drain ? SAMSUNG GALAXY ON7 (PRO) is good smartphone with 5.5 inches LCD screen. This phone have 3000 mAh battery capacity to make this phone can work fully one day without recharge. But if we want to play full movie or playing games for long time, then this battery will not work for one day. Therefore we have to do some adjustment like make LCD screen brightness as low as possible to safe SAMSUNG GALAXY ON7 (PRO) battery life. The next setting options that we have to adjust are disable all not use connections like Bluetooth or GPS or Wifi, because when they are enable, this connections still eat some amount of battery although if we are not them. Therefore make it disable will keep our battery life longer. The information from this page describe about restarting samsung on7 pro. If you need another resource for hard reset, use search function at this homepage or find from our related posts. How to Easily Master Format MOTOROLA MOTO G3 (DUAL) / MOTO G 3rd GEN (XT1550 / XT1543 / XT1544 / XT1541 / XT1540 / XT1548) with Safety Hard Reset? How to Easily Master Format HONOR NOTE 10 with Safety Hard Reset?